For the latest news or prices, visit the Fest tab in our header. Welcome to the launch of my passion project: Cat Film Fest at Sea™. You’re invited to be a part of cat culture history. 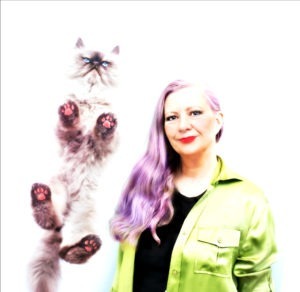 Over two years ago, I got the idea for creating a unique experience for cat lovers where we can connect in person, be inspired by cat culture and each other. 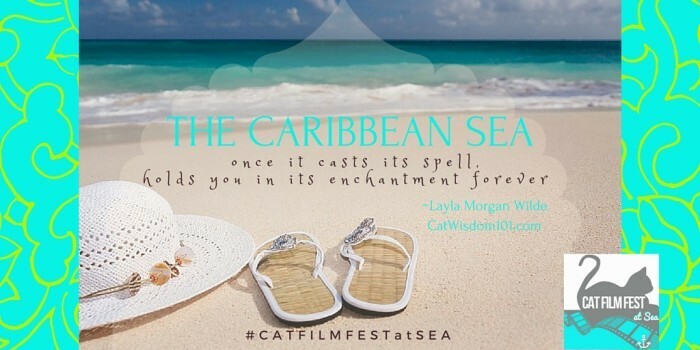 Last summer, my vision came together when the ideal partners paved the way for me to produce Cat Film Fest at Sea™, the first cat film, art, video and pop culture Caribbean cruise. That’s right, a ship and not just any ship but Oasis of the Seas, the $1.4 billion floating vacation destination where every passenger is a celebrity citizen and normal rules don’t apply. It’s an opportunity to see and experience your life with fresh eyes. Take a look at this short video to see the possibilities. This time next year I’ll be packing my cat ears because we’re sailing from Ft. Lauderdale, Oct. 29, 2016 on National Cat Day and I hope you join me. Halloween will never be the same since we’ll be celebrating on board with a wild costume party and black cat video screening in honor of National Black Cat Month™. We’ll even be able to memorialize our beloved OTRB cats at sea in Mexico on Nov 1st for Dia de los Muertos. The Cat Film Fest at Sea™. highlights include a full Broadway production of CATS, a private red carpet gala screening with awards, a curated art show for charity and much more.The cruise countdown will include lots of contests, a curated art show and a chance to win a Cruise and VIP pass for 2! We’re purring with delight to announce the curator of our exclusive cat video reel is the award-winning Chris Poole of Cole and Marmalade. His funny cat videos have over 53 million views. We’re in talks with our friends at Catastrophes to curate a special reel. They won the 2015 Internet Cat Video Festival. Stay tuned for news of other special guests coming on board. I’m beyond excited to reveal all the details. The press release is going out early in the new year so consider this a sneak peek. There are so many amazing aspects of this cat fest/cruise/extravaganza, I’ll be rolling them out gradually at our new weekly blog feature about the cruise, the ship, tips and cat culture. Don’t worry, Cat Wisdom101 will continue as usual. Consider the cruise fest as the icing on the catnip cake of our growing brand. This is the first of other pet-centric cruises planned so if you’re a dog lover, you’re in luck. What sets this apart from other cat arts festivals is the incredible venue and value of a combo festival and vacation with 3 ports-of-calls. Imagine only unpacking once and having time to enjoy it all as quietly or loudly as you like with your own kind: cat lovers. There is something magical about being at sea with intoxicating, balmy breezes that stir the heart and imagination. Impossible to explain until you experience it. If you’re ready for something new, different and meaningful, it may be time to smell the sea and touch the sky, let your soul and spirit fly. Give yourself permission to escape and live like a pampered cat for 6 days.Expect pleasure. Demand indulgence. Play. Purr. Nap. Explore. Repeat. Did I mention free room service is included? MeWOW! This intimate and exclusive event is limited to only 200 lucky cat lovers and one famous celebrity cat. so book now! Cabin/Festival packages are from $839 p.p. +tax. Round up your girlfriends or spouse fast. The first 50 passengers who book get early bird pricing and a free upgrade to a Superior Balcony Stateroom. The Full VIP Festival Package and Stateroom is $1070 p.p. +tax Our travel partner is BigCruiseAdventures Lisa is the booking agent and can answer any booking questions only. Her Direct line is 317-412-2542. Disclaimer: All advertised events are exclusive to guests who book through Sea Conferences only. 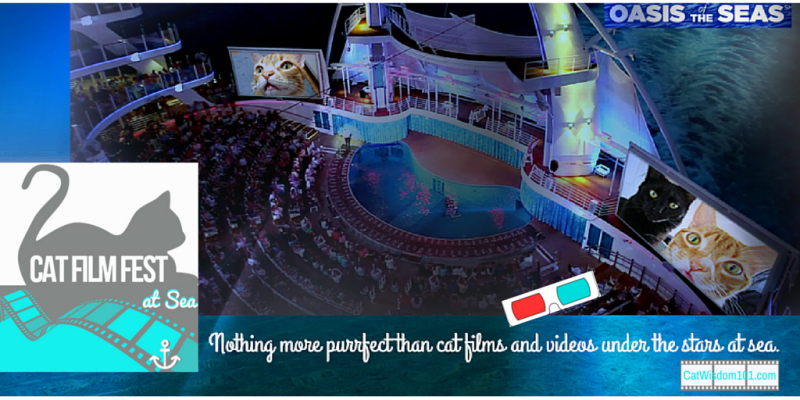 Cat Film Fest at Sea™Cruises are group events and not chartered vessels. All rates are cruise only and per person, based on double occupancy subject to availability at time of booking. Non-discountable fees and taxes, airfare, air taxes and transfers are additional. Festival Event based on a minimum of 200 group passengers. Pricing and other information may change without notice. We reserve the right to correct errors. Information and pricing are subject to change without notice. No passengers may bring their cats but flat cats are welcome on board. Dad wishes he could go. We wish he could too so we could do what we want! win a Cruise and VIP pass for 2? Ears perked up. Gosh that would bee something for sure! Wow! Wow! Wow! This is just so exciting!! Layla..this is such a wonderful and exciting fulfillment of a dream! This sounds like an amazing trip for cat-loving humans. Mom says she can’t wait to read more about it. What fun! Hope it’s a great success. OH MY MO– — USES! That sounds amazing, for sure. Hmmm… Just for peeps who love cats or for cats, too? Inquiring minds wanna know. Just the peeps but we may have a celebrity cat surprise on board. Wow! That certainly sounds awesome — and FUN! Congratulations on making this happen, Layla. We will look forward to hearing more in November! ConCatUlations on a fabulous idea and making it come to life! This would be a DREAM trip and I would give anything to go. We look forward to hearing more and learning about all the other pawesome peeps involved. OOoooo that looks so fun. A cruise one day is on my bucket list but rightt now isnt the time. It looks like a wonderful thing and such a wonderful time. I will liive vicariously through the pictures to come. Thinking of you Merlin and sending meezer strength. I am so happy you get to do this Layla. and will keep sharing! That sounds like a wonderful cruise. I never leave my cats more than one night, I would have an anxiety attack ( literally) if I did, but I will spread the word to everyone I know. Oh my paws that is just plain incredible. We so wish we could do this, but with things like they are in our life we can’t. Although we would love to ^sigh^ if things were different. Concats on being able to make this dream a reality. CONGRATULATIONS! I have to talk to my boyfriend and see if we can swing this. We’re moving next year and are starting to budget. BUT this could be our last vacation for a few years. It sounds like it will be a great time. I’m very happy for you. Meow dat looks and sounds pawsum. We kuld never affurd it and since cats awen’t allowed we kuldn’t go anyways. Nor kuld mommy as she requires us to get fwu each day. But we sure hope all who do go have fun. Weez’ll be wishin’ we was there. This looks amazing! I and the meow.com crew will be there! Ahoy Kitties! Got a bit dizzy looking at some of those activities in full screen. But it sure looks like those who are able to go will have a great time. There’s so much to do on board but everything is optional and there are lots of cozy quiet spots too. Holy Moly Guacamole Terra- Hautee Indiana! This sounds AMAZING!!!!! We can’t wait to hear more! Mom wants to know if they need an on board Cat Tarot Card reader… MOL! What an amazing new adventure you have conjured up! Hugs to all and extra special love to the Old Meezer Man… we all love you Merlin! There’s nothing more fun than meeting other ca lovers face to face! Merlin is a little better thanks. What a pawsome event/vacay. Thanks for making it come together. I have a couple of friends who love cruises and cats and I’ll pass this along. I can’t wait to keep reading about this adventure. What an awesome vacation idea! Wow! What a pawsome event. We’re sending this to the Male to see if he is interested in doing this–he was just talking about sunshine in the Caribbean! Well! You’ve been/will be busy. This is different. Love Oasis of the Seas. Wow, what an awesome idea and once in a lifetime opportunity for the lucky cat lovers who attend! Concatulations!!!! It all sounds soooooooooooooooo exciting and we wish you all the best in this venture!!!! We Purr all will exceed the expectations and be a huge ongoing success!!! We hope our dear Merlin is doing well!